It’s never really winter in Santa Fe like it’s winter on the east coast. But the nights do chill down and the days aren’t always bright and warm either, especially in January and February. On those chilly nights, when you really want to snuggle up and stay warm with a cup of hot chocolate, you need a meal that’s comforting and hearty. 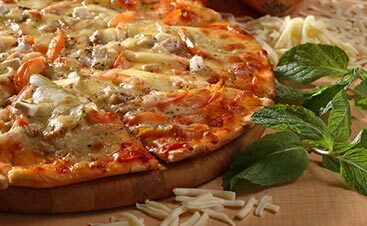 When people think comfort food, it’s all about macaroni and cheese, potatoes, or thick soups, but why not think pizza? It has carbs, salty cheese, and with the right toppings, a variety of flavors can be found in each bite. 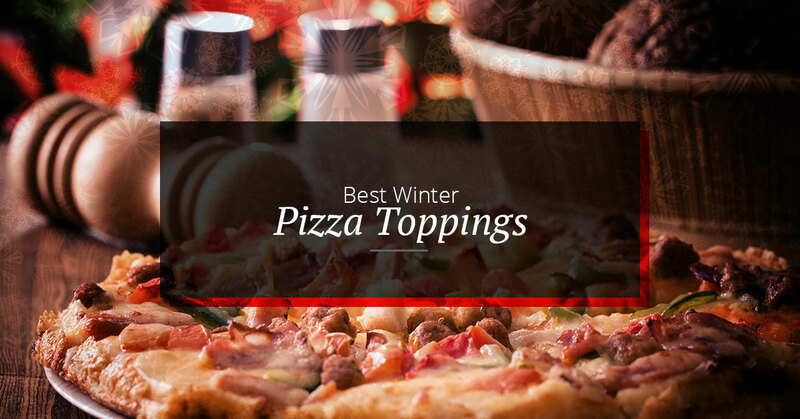 So what are the best winter pizza toppings? Don’t roll your eyes quite yet. Just because brussel sprouts are every child’s nightmare, doesn’t mean they won’t add a level of flavor that you haven’t yet experienced on a pizza. 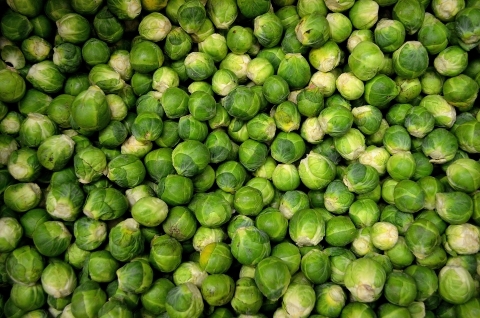 At first glance, brussel sprouts are bland, boring, and they don’t even really have a good texture to its advantage. But take another look. When brussel sprouts are sliced thinly, cooked up with some olive oil, and with a healthy layer of provolone cheese on top — yum. And then add spicy sausage, a pesto sauce, and a perfectly crispy crust — double yum. Stop with the greens! This is supposed to be comfort food! Well, when you sink your teeth into this surprising pie, you’ll be wishing for cold weather so you can make it again. What is so surprising about this pizza is that the sweet potato is actually the sauce! It’s slightly sweet, creamy, and even if you may not want it to be, healthy. Add on top torn pieces of kale, goat cheese, and parmesan cheese and bake it up! In the last couple minutes, sprinkle on some chopped walnuts for a welcomed crunch. Apples aren’t just a late summer and fall food. The sweetness of the apple combined with tangy goat cheese, and a sharp and somewhat spicy flavor of Dijon mustard is a pizza perfect for staying warm next to a fire. This is far from a traditional pizza, but you haven’t lived until you’ve had apple on a pizza. Now we’re talking. What says warm winter vegetable more than butternut squash? And the earthy smell and taste of gorgonzola is the perfect partner. Add in some sage and red onion to fill out the pizza and yes, you might not want to snuggle up too close to your partner before popping a mint, but you will have one tasty winter night pizza. For any readers we might have lost with so many healthy toppings, this one has bacon. The winter pizza of all winter pizzas has toppings that are truly comforting. 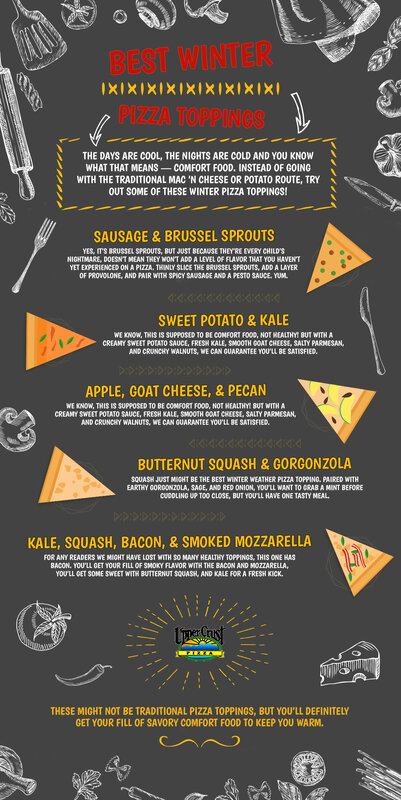 You’ll get your fill of smoky flavor with the bacon and mozzarella, you’ll get some sweet with butternut squash, and kale for a fresh kick. 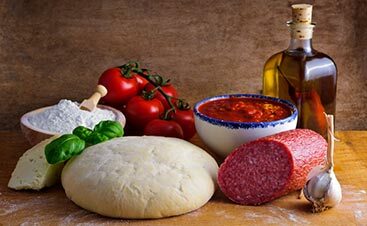 Add these toppings to a thicker, but light crust for a taste that you’ll remember. For craft pizza in Santa Fe, visit Upper Crust. 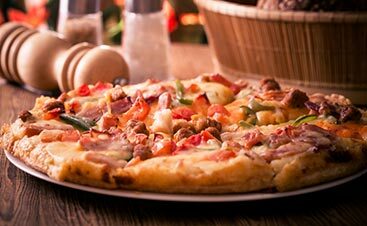 Whether you dine in or have your pizza delivered, we’ll make sure your warm, cozy, and comfortable throughout your meal.